" Welcome to LowCarbonWorld: Connecting global activities & organisations to accelerate progress towards Low Carbon Economies. Select a country from the map or list below to get started... "
" The internet is successfully facilitating a transition from traditional so called "brown" business models to new green growth strategies. 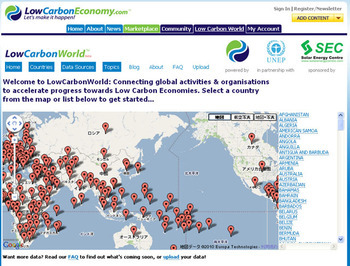 The "Low Carbon World" website, a web-based communications platform - www.LowCarbonEconomy.com - was officially launched today (Thursday) in Bali, Indonesia at the United Nations Environment Programme's annual Governing Council. The new website, a joint project between Low Carbon Economy.com and the United Nation's Climate Neutral Network (CN NET) http://www.unep.org/climateneutral/ aims to facilitate the move to global low carbon economies, a necessary imperative if we are to combat dangerous and escalating climate change. The new website will assist knowledge transfer and simplify access to information and tools that can be difficult to trace. www.LowCarbonEconomy.com will list every country's carbon policies, commitments, historical performance, future projections and opportunities, as well as country-specific marketplaces, networks, associations and standards which are relevant to government departments and investment agencies.